If you have been convicted of a felony or misdemeanor you have a right to appeal the conviction and sentence and an opportunity to have the conviction or sentence overturned on appeal by an experienced Tampa Criminal Appeal Attorney. It is by law that a defendant (or the state) may appeal in criminal cases (See Florida Statute § 924.02). Your pursuit of justice should not be deterred because you are convicted of a crime and/or received an unjust sentence. Do not give up. Many times your constitutional rights to post-conviction relief by means of an appeal or post-conviction motions is your last and best avenue in your pursuit of justice. Experienced criminal appeal lawyers can review your file and determine if you have a valid criminal appeal or post-conviction relief (3.850). Occasionally, the government oversteps the line between a legal conviction and an illegal conviction. Sometimes the government or its agents induce an offense when an individual is not predisposed to commit the particular crime. Occasionally, the government or its agents obtain statements or physical evidence illegally. Sometimes the police improperly stop a vehicle and obtain evidence based on that improper stop. Occasionally, the government obtains an illegal search warrant based on insufficient or fabricated facts. Sometimes the prosecutor fails to disclose favorable evidence. Occasionally, the government does not present sufficient evidence to support a conviction. Sometimes the jury is given improper jury instructions. Occasionally the judge is biased and refuses to step down or disqualify himself or herself. Sometimes the judge imposes an illegal sentence. Sometimes the court does not follow the law or incorrectly rules based on improper case law. Why Should I Contact an Appellate Lawyer? Government agents may not originate a criminal offence and then induce commission of the crime so that the government may prosecute. The government may not obtain incriminating statements while a person is in custody without first advising that person of his Miranda rights. The government may not search a person or property without probable cause or a search warrant. The police may not stop a vehicle unless they observe a traffic violation or have a reasonable suspicion that a crime has been committed. The government may not obtain a search warrant without probable cause to believe that contraband or evidence of crime is currently at the location in question. The government is require to provide a defendant with all the evidence in its possession, including evidence that tends to prove that the defendant is innocent. The government is required to show that a crime has been committed and must prove beyond a reasonable doubt that the defendant committed that crime. The jury must be correctly instructed on the law of the case and cannot be mislead by those instructions. A trial court judge must be disqualified when a party fears that he or she will not receive a fair trial or hearing because of specifically described prejudice or bias of the judge. The appearance of impropriety or bias is of special concern where the branch of government involved is the judiciary. A trial court judge must impose a legal sentence under the law. If you believe that you have been improperly convicted or sentenced, you have a right to appeal the conviction and sentence, and an opportunity to have the conviction or sentence overturned on appeal. If you have been convicted in State court you have thirty days to filed a notice of appeal. If you have been convicted in federal court you have ten days to file a notice of appeal. If you do not file a notice of appeal within the required time you will forfeit your right to appeal. Fernandez & Hernandez has a proud track record of successfully representing criminal clients in an appeal in criminal appeals and post-conviction motion in both state and federal court. Attached are the list of cases our attorneys have appealed. Between January of 2000 and September of 2018, our attorneys have appealed 34 cases in the District Courts and 1 to the Florida Supreme Court. One of the biggest benefits associated with hiring a qualified lawyer for your appeal is that you increase your chances of getting the relief you deserve. A skilled and experienced appeal attorney will be able to research and write, and handle other complicated aspects of your case. Criminal appeals: The attention to detail we show in all of our work is especially important in appellate work. We look for errors on every line of the trial transcript and motions. When a client was not represented by a competent trial lawyer, a plea was not entered voluntarily, newly discovered evidence is presented or a prosecutor committed misconduct, our criminal appeals attorneys know how to seek justice in our pursuit of remedies. Post-conviction: The United States Constitution, as well as Florida’s Constitution, guarantees that every accused person receive effective assistance of counsel. Many times, the criminal representation of a client by a defense attorney falls below the constitutional standard of competency and, therefore, results in a miscarriage of justice. Likewise, exculpatory evidence is sometimes discovered after the trial and sentence. The criminal justice system allows post-conviction motions to correct those injustices. Good attorneys that specialize in appeals have the knowledge and resources necessary to resolve your case as quickly as possible. If you don’t want to wait a long time to get the relief you deserve, you will need to hire an experienced appellate lawyer as soon as possible. Why? Because experience and results count. The law and rules governing appeals are highly complex. It is important to act quickly and secure legal representation. The attorneys at Fernandez and Hernandez have experience in executing appeals and will work vigorously to protect your rights, and in many cases, may be able to prevent an injustice. When researching appellate attorneys, make sure that you use a reputable website so you can be sure that the results you get consist of legitimate, well-respected professionals. Some of these directories even offer reviews of lawyers and detailed information to help you save time doing research into them. We recommend also reading the Tampa Criminal Lawyers reviews on Google Reviews, Avvo and Yelp. Attorney Daniel J. Fernandez of Fernandez & Hernandez, LLC provides legal representation in appeal cases. Our appeal attorneys welcome the opportunity to interview with you. Our qualifications and background are available. Our Tampa Attorneys Daniel Fernandez and Martin Hernandez are bilingual as well. The appeal lawyers of Fernandez & Hernandez serve Florida communities including Tampa, Brandon, Carrollwood, Westchase, Riverview, Temple Terrace, Pasco, Pinellas, St. Petersburg, Clearwater, Lakeland, Plant City, Ruskin, Apollo Beach, Dover, Valrico, Lutz, Lakeland and many other neighborhoods in Tampa Bay area. 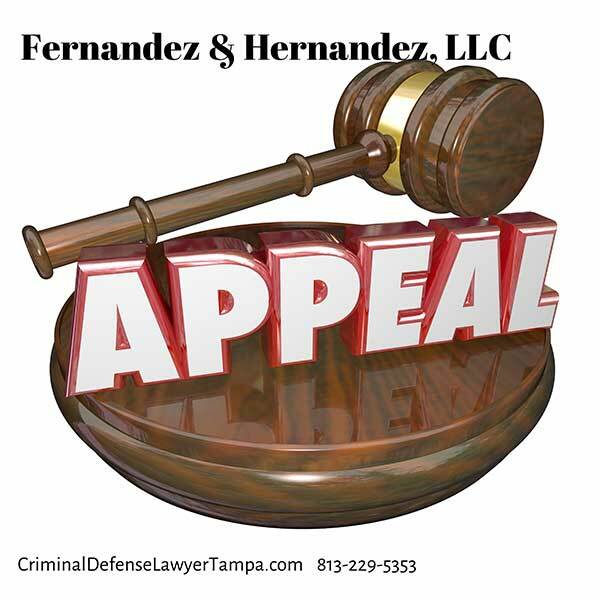 Contact an Experienced Appeal Attorney from Fernandez & Hernandez Law. If you have been convicted in the Tampa Bay area and believed that the conviction or sentence is improper, call Appellate lawyer Daniel J. Fernandez of Fernandez & Hernandez. Tags: appeal in tampa floridacriminal appealcriminal appeal in tampacriminal appeal lawyer in tampawho should I hire to handle my criminal appealWhy Should I Hire a Tampa Criminal Appeal Attorney? PreviousPrevious post:Why Should I Hire an Injunction or Restraining Order Attorney?NextNext post:¿Por qué debería contratar a un Abogado de Violación de Libertad Condicional?